It is Friday night and Jeff (Russell Crowe) can barely contain his excitement and nervous energy. He feels it is time to approach the person he has had his eye on, a fellow named Greg (John Polson) who frequents the same pub as him. 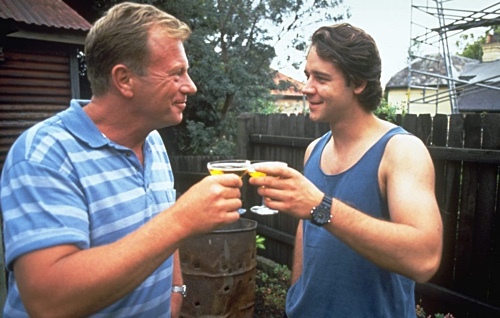 Jeff lives with his father, Harry (Jack Thompson), who is aware and has accepted his son’s homosexuality. Harry, too, a widower, is searching for love. With the help of a dating agency, he meets Joyce (Deborah Kennedy), a clean and proper woman. With plans of taking their relationship further, Harry wonders if the new belle in his life could accept the truth about his only son. Many LGBT-themed movies center around the idea of parents finding out the truth about their son or daughter, wrestling with the idea, and coming–or not coming–to terms with it, so it is most refreshing that “The Sum of Us,” based on the play and screenplay by David Stevens, is about a father and son who have gone through the coming out experience. The attention is now toward other people, who may or may not be accepting of lifestyles outside the sphere of heteronormativity, and the familiar fear of rejection. Harry and Jeff address the audience directly about their thoughts that go unexpressed, equally effective as a comedic and dramatic tool. When one gets very annoyed from a barrage of ill-timed jokes, the other stops and turns toward the camera thereby having a chance to let go of the remaining quips. Conversely, when something is too painful or ought not be expressed to someone else at a particular moment in time, the asides force us to get closer to the sensitive situation by allowing us to absorb what a character is thinking fully. The temporary disruptions from the flow of the story is utilized with balance and control. The flashbacks, shown in black and white, are designed to further our understanding of father and son. With Harry, most important is his first time experience going to a gay pub after he learns about his son being attracted to other men. With Jeff, he recollects spending fun times with his late grandmother (Mitch Mathews) and the implications behind Gran having a live-in partner named Mary (Julie Herbert). The common thread is curiosity and the past is used to weave a bridge to make sense of the present. Directed by Geoff Burton and Kevin Dowling, “The Sum of Us” is ultimately about the love within a family, not “gay” love or “straight” love. It avoids easy solutions to complex circumstances, but at the same time it is brave enough to make us laugh when things take a serious turn. It is a way of coping, a slight nudge to remind the good that remains.